Posted by O.J. in Amman, Jordan. Note: The picture above is dated 2 March 2006 and is copyrighted material by the photographer Kurt Feller. Some call it the most spectacular construction site in Amman; others call it a monstrous disaster. Some think of it as Jordan’s modern landmark; others think of it as an unnecessary waste of government funds. Some think it will solve traffic congestion problems in Amman, while others disagree completely. 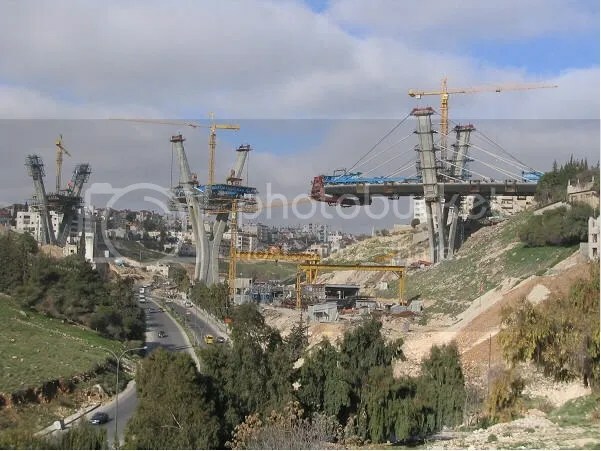 Whether you are driving under it or along side of it (on one of the many detour roads), you can see that the Wadi Abdoun Suspension Bridge looks almost complete. All that is left is a small gap where the final piece should fit like a puzzle and voila!…You have Jordan’s Golden Gate Bridge; without the water of course. The bridge, however, will not be ready to welcome our diesel infested cars (that’s another topic all together) until the 4th circle tunnel and Abdoun circle tunnel are complete. Amman residents who suffered the most from the detours and the horrible traffic, have questioned the viability of the project. Many of them don’t really think the bridge was necessary. The 417 meter long bridge actually passes straight through some residential areas. The construction of the tunnel under Abdoun circle has caused a huge loss in profits for many of the stores and restaurants in the area; especially for the summer season during which Abdoun circle is packed with people wanting to spend. *UPDATE* The Wadi Abdoun Suspension Bridge is now complete and open to the public. Dude, it should definitely help with Amman traffic. It is going to divert traffic coming from north and east Amman from going through the 4th to the 7th circle in order for them to get to the airport road. We suffered the last year but it should relax things for the coming 10 year. At least I hope so!!!! The 4th circle is the core of Amman. The bridge and tunnels etc.. after completion – will no doubt help traffic…. But there are a lot of people who are scared to use it! It’s construction was very costly and other alternatives should’ve been taken. I am not so sure the design is the right one, it looks a bit out of context – too modern for a city like Amman – I personally think an old looking roman bridge with arches would’ve looked more secure and aesthetically more appropriate for our Amman. Why don’t we just wait and see how it works out. I am sure it will be better than the way things are now! Work of art, as is the case with most bridges, tunnels, etc.. in Amman. If only they keep the money and feed people who can’t find food for days.. Find 2000 families of no income and give each one a house (worth about 50000 JD -Lets be honest how much can it cost?) and monthly of 1-200 Jds support to get education for the kids or something like that and you get something much better than a great view. That is hardly what we need now In Amman or Jordan.. Maybe in 10-15 years when there actually is a point to all this! But then again, maybe (Tantat) Abdoun would like the view… and flan and 3lan need money in the pocket!